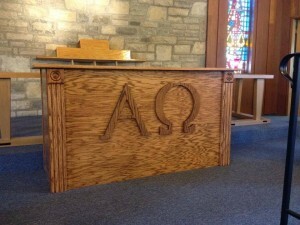 We recently installed church pews in Beautiful Savior Lutheran Church in Grove City, Ohio, to give the church an updated look — and we also gave the church a makeover at the altar. The front of the church has space for a pulpit, a lectern, and an altar table. The three remind us of the symmetry of the Father, the Son, and the Holy Spirit so it’s important that these three share similar traits to mirror this symmetry and look appealing to the eyes. 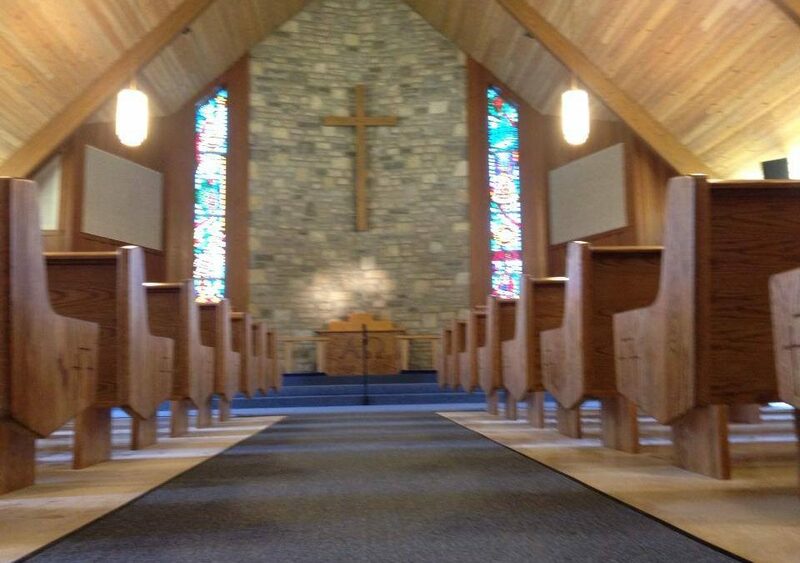 We built the three church furniture pieces to fit the space and match each other well. 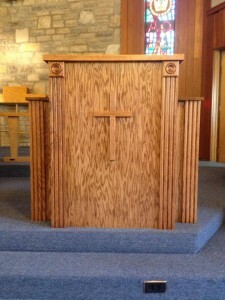 Each piece of church furniture at the front of the church is unique, from the pulpit to the lectern. These two pieces of church furniture are often exactly alike in churches that use both, but Beautiful Savior wanted there to be differences between them. The piece at the left of the altar table is a lectern of a simple, straightforward design, show at right here. It takes its shape from our Pastor style pulpit but has some differences in the facade and the structure. There is a stand for the church’s Bible on this one to make reading easier as well as Federalist inspired woodworking on either side. In the middle is a simple wooden cross. On the other side of the altar is the pulpit, which has a more substantial footprint with flanks on either side of the main, middle stand. If you look closely, you’ll notice that this pulpit is slightly different from the lectern because it doesn’t have a book stand built into it, nor is the top as thick. However, the pulpit shares the same facade style as the lectern with woodworking details and a simple cross. Why have differences between the two? While both parts are equal in the service, each is separate and different from the other. 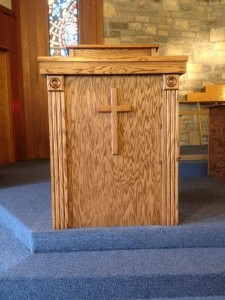 Indicating the difference between speaking from the pulpit and reading from the lectern with visual cues helps congregation members see the difference between a sermon and the Word from the Bible. Beautiful Savior asked for these special symbols to be displayed on their altar table. Since we custom build every piece of furniture we make, it’s a request that we can easily accommodate. You’ll also notice that this table shares the same facade as the two other pieces of church furniture to maintain symmetry. 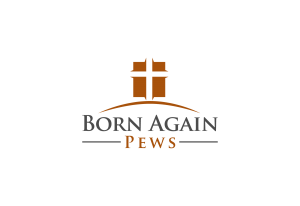 If you’re looking for church furniture for your altar and need multiple pieces, we can help you design them so they match each other well and fit your church’s needs. Call us today to find out how.